Given a countable set of states, a Markov chain is a sequence of random variables X1, X2, X3, … with the Markov property: the probability of moving to the next state is independent of previous states given the present state. 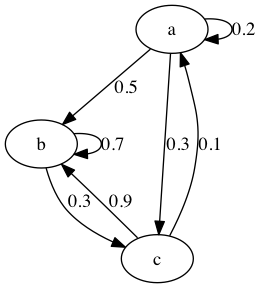 A Markov chain can be represented by a directed graph. The outgoing edges for each node should sum to 1. If the number states is finite, we can describe the chance the process is in each state at a given time with a vector xt of probabilities which sum to one. If we choose a column vector, then we can use a left transition matrix T—also called a left stochastic matrix—to get the chance the process is in each state at the next time. The columns of a left transition matrix sum to one. If row vectors are use for the state probabilities at a given time, then a right transition matrix with rows that sum to one is used to calculate state probabilities at the next time and the order of multiplication is reversed. A Markov chain is regular if there is a positive integer n such that all entries in the transition matrix Tn are positive. This is equivalent to saying that starting in any state, after n steps the process could be in the original state or any other state. A state is transient if there is a non-zero probability that the process will never return to the state. Otherwise the state is said to be recurrent—or persistent. An aperiodic state is a state with period 1. A state is absorbing if a process never leaves it once it is entered. The mean recurrence time is the expected value of the hitting time. The mean recurrence time can be infinite even if the hitting time is finite. If the chance of eventually reaching state j from state i is greater than zero, state j is accessible from state i. States i and j are communicating if i is accessible from j and j is accessible from i. Communication is an equivalence relation; the equivalence classes are called communicating classes. If the states in a Markov chain belong to a single communicating class, the Markov chain is irreducible. A state is ergodic if it is aperiodic and has finite mean recurrence time. If a Markov chain is irreducible and all its states are ergodic, then the Markov chain itself is ergodic. If we can represent a Markov chain by an initial state probability column vector and a single left transition matrix T, the process is said to be time homogeneous. The state probability vector is an eigenvector of the transition matrix with an eigenvalue of one. It is also a fixed point of the state transformation function. A stationary distribution is not guaranteed to exist or be unique. However, an irreducible Markov chain has a stationary distribution if and only if all of its states are ergodic, and if so the stationary distribution is unique. If a Markov Chain has a unique stationary distribution, then we can use the Markov Chain Monte Carlo method to sample from it. We choose an initial starting state x1, and then for each state xi we choose xi+1 by randomly sampling according to the probabilities in the i-th column of the left transition matrix. With a sample of 10,000, the algorithm was able to get two digits of accuracy. Suppose that we have a Bayesian network with evidence e for the variables in E—possibly empty—and we would like to estimate the probability distribution of the remaining variables X.
and if the Markov chain is regular, then π is the unique stationary distribution for T.
Suppose that have a "proposal" distribution Q(x → x') which gives the possibility of selecting the next state x' when we are at x. We want to find an "acceptance" distribution A(x → x') which either accepts the proposal—in which case the next state is x'—or rejects the proposal—in which case the next state is x—such that the detailed balance equation holds.